The S Series screw pumps are part of Maag’s newly created Industrial Pumps platform, which also features both external and internal gear pump technologies. Maag Industrial Pumps will feature a new brand image and pump technologies targeting general industrial applications. Maag S Series pumps are ATEX-certified for use in explosive or dangerous environments. Maag’s screw pump technologies address difficult pumping challenges. Maag S Series pumps will be able to provide solutions that can meet the toughest application challenges regardless of temperature, viscosity or pressure. 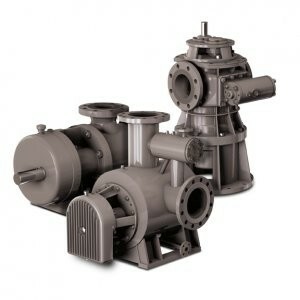 WTG Twin Screw pumps are offered with a double-suction design configuration. Twin Screw pumps with timing gear transmissions are perfectly suited for transferring countless fluids, including low-lubricity fluids, or even abrasive mediums. NTG: These Twin Screw non-timing gear (NTG) pumps with single-suction design are especially suited for delivering various lubricating fluids with high viscosity, such as bitumen and residual oil, at medium or high temperatures. Multi-phase: Designed for medium- to low-pressure applications, the Multi-phase pumps are robust, reliable and built for long service life. Maag’s Multi-phase pumps are commonly used in Oil & Gas production fields and gathering systems that have untreated streams.